This entry was posted in Equity Market and tagged 10-nanometer chips, 14nm processor node, 7-nanonmeter, Accenture, AI, AI bias, AI datacentre, AI macro-economic impact, AI productivity gains, algorithmic trading, Amazon, AMD, application-specific integrated circuit, artificial intelligence, ASIC, augmented intelligence, automated customer service agents, automated threat intelligence, automating processes, Baidu, bias algorithms, big-data chip design, central processing units, CenturyLink, chatter bot Tay, cloud-computing service, cognitive learning, consumption-side product enhancements, convolutional neural networks, CPU, DARPA, deep learning, digital transformation, domain-specific architectures, Facebook, feed forward neural networks, field-programmable gate array, Financial Machine Learning, FPGA, GOOG, Google, GPU, graphics processing unit, Heterogeneous Future, IDC, integrated circuit, Intel, intelligent networks, interconnected neurons, labelled training data sets, local-interpretable-model-agnostic explanations, machine learning, Marcos Lopez de Prado, McKinsey, Microsoft, ML, Moore’s law, multi-objective genetic algorithms, neural networks, neural units, NVDA, NVDA revenue projections, NVDA valuation, Nvidia, optimise chip design, portfolio optimization, preventative maintenance, PwC, recommender system, recurrent neural networks, robotic process automation, robotics, semiconductors, software lead chips, software-defined hardware, Spatial Computable General Equilibrium Model, specialised chip designs, supervised deep-learning algorithm, Tencent, tensor processing unit, TPU, Transfer learning, Twilio, Xilinx, Yext. Bookmark the permalink. I think AI (esp. deep leaning and neural networks) are close to or at the maximum of the hype curve (see https://www.gartner.com/smarterwithgartner/top-trends-in-the-gartner-hype-cycle-for-emerging-technologies-2017/). When I hear people saying that „thanks to AI computers will be able to program themselves in the future“ I consider this a good indicator (hint: this is utter nonsense, mixing up level and meta-level). AI provides a nice set of tools to fit complex data sets and for sure there will be applications going forward, though. My favourite BS indicator at the moment: linear regression is also an AI method (you fit a model to some data using a gradient method). If the text you read still sounds good after substituting every occurrence of „AI“ by „linear regression“ you might be on to something. 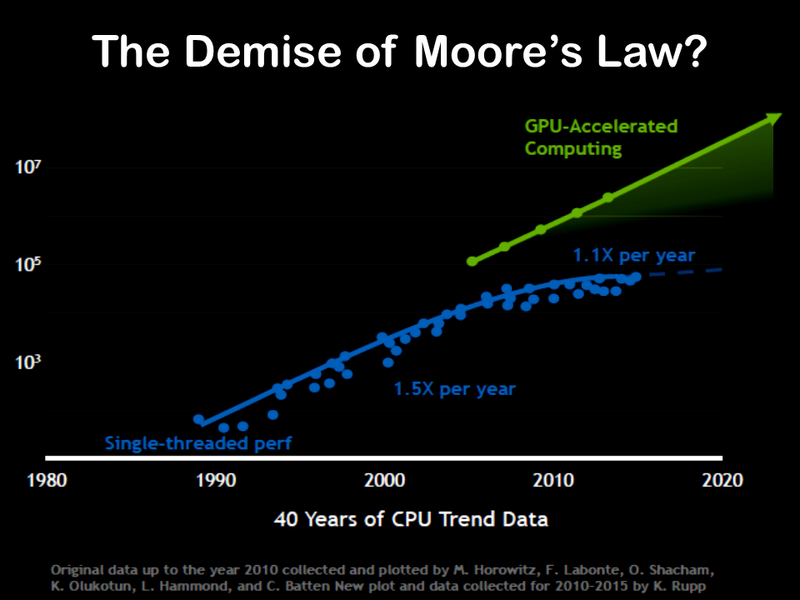 Re demise of Moore’s law: if you shift the green line to the left (where the blue points still form a straight line) it doesn’t look like Moore’s law is dead. GPUs will face the same constraints at some point in time, although they are faster due to a higher degree of specialisation. One of my major issues with various (but not all) AI methods is that you can’t interpret the results. What does it mean if you tweak some weights in your neural networks? Other, more structured methods like boosted trees are more open to interpretation, though. This provides also (partly at least) a feedback loop to training of AI and potential SNAFUs (remember the picture recognition tool that identified black people as monkeys, presumably because it was mainly trained with Caucasian types?). I agree about the hype Eddie, experience has thought me to stay away from one issue stocks in the middle of hype! my BS indicator….been there, got the T-shirt! But I do think AI can improve the effectiveness of certain existing analytics. I was taken with how AI is helping CTL being more dynamic in their capex expenditure. They way I think about it, a computer driven underwriting system can be one dimensional and not be able to handle decisions on comparing heterogeneous risks whereas AI may. And if it works it will quickly become the norm. I totally get that real uses of the outputs from AI are totally dependent upon how they are programmed and the data used to parameterize. The hype has to be taken with a big pinch of salt. 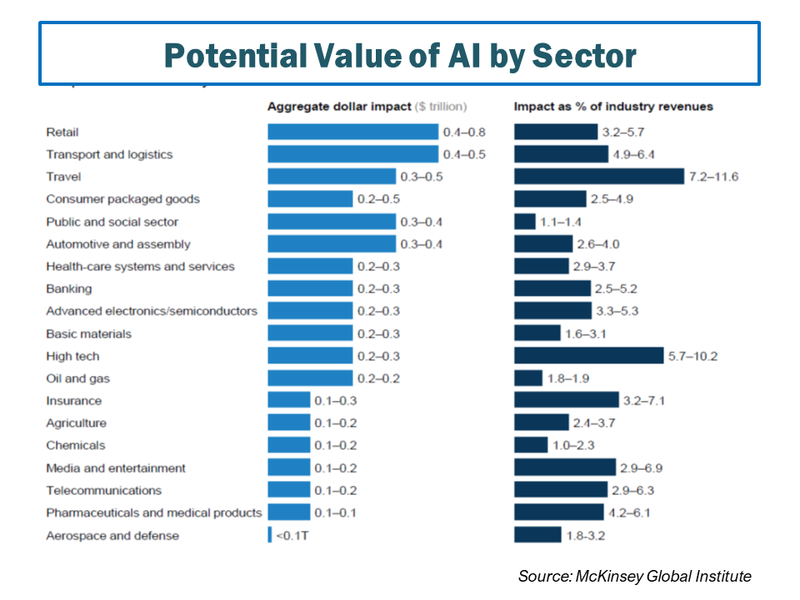 McKinsey seem to have it right by focusing on AI’s ability to improve existing analytic systems rather than automate existing processes from scratch. 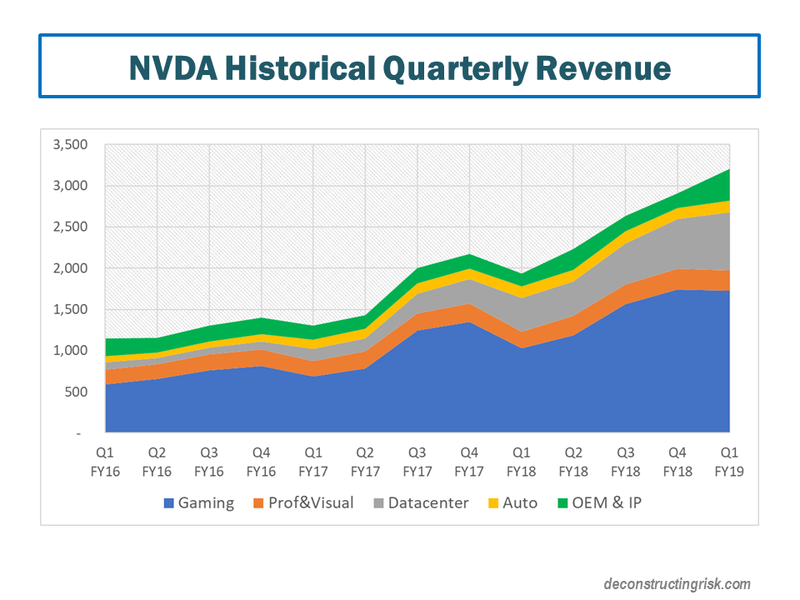 Nvidia is a mega hyped stock but short term its head start may make it a candidate for trading. I think the big winners longer term will be the likes of Google. 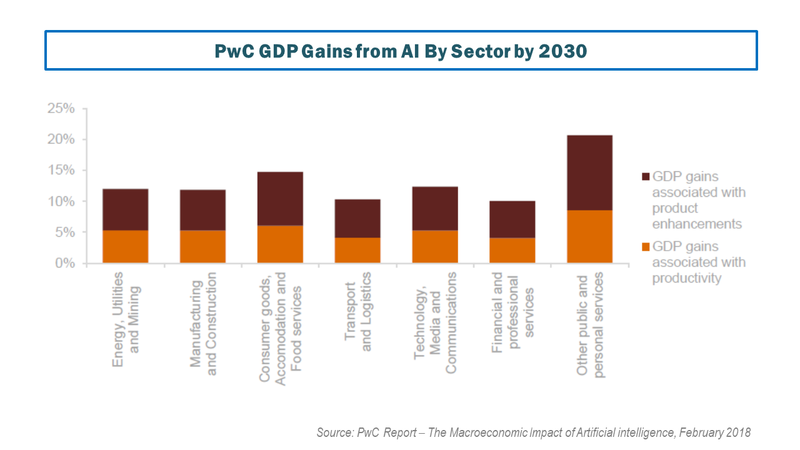 Obviously any AI upside is in addition of the strength of its existing business. Heard positive things about Baidu but still too nervous about China. Just kicking ideas around until the macro issues become clearer (and whether Trump bluster is contained!) Hopefully a meaningful dip clears the air on hidden pressures. Market does feel very 2000-ish to me, nervous but nobody wants to be out in case it breaks to upside. Poor old Einhorn is getting blistered on the value end!! Hope you enjoying summer, be goog! Agreed. I think AI has ist merits when analysing big data sets or data where there is no obvious model choice. Probably supporting humans on the way by doing grunt jobs that have to be done, so that people can focus on the more „non-standard“ aspects. 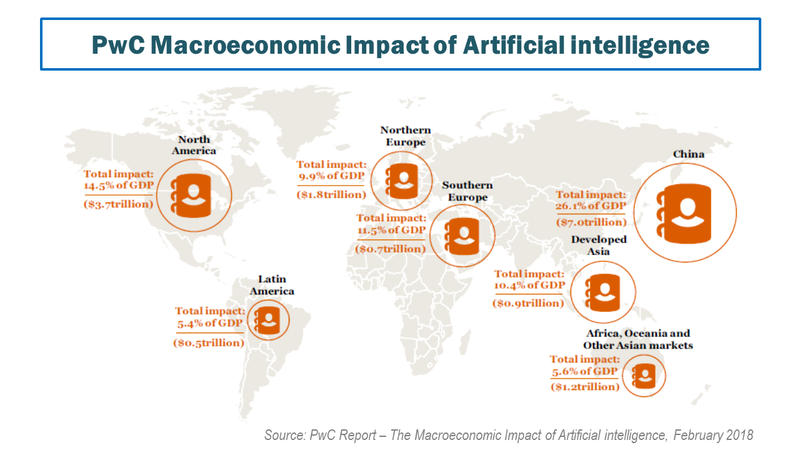 The main issues imo (and it sounds like McK thought along similar lines) is that AI is not „intelligent“ after all, i.e. those models extrapolate existing data but have issues when something new comes up. There is no such thing like a transfer of knowledge. Pity Einhorn. This reminded me that it is darkest just before dawn. He does his job and gets roasted. I do. Enjoy the coming heat wave as far as possible. Yep, I saw that, not everything is going its way. But excluding the OEM segment, they grew revenue 7% sequentially and over 50% YonY. It does show how quickly some of their segments can disappear. I suspect they have a lead advantage in gaming, just not too sure about datacentre & AI opportunities. I am wary that I don’t know this sector too well so will keep digging!!! back of envelop stuff, I think they can grow top line over 30% this year and next. Will have to have a close look at bottom line as this is a pricey much hyped stock.